Water kefir grains do not contain any actual grain. They are just called grains because of their shape. The kefir grains are just symbiotic microbial communities living in a polysaccharide matrix. Sounds complicated right? Just think of it as a mixed population of little microbes who build themselves little houses to live together. Water kefir is similar to kombucha, but kombucha is mostly populated with yeasts, while water kefir has a heavier bacterial population. Normally when brewing water kefir, you just use a sugar water mixture for the primary fermentation. When we make the liquid mixture for the first fermentation of water kefir, we add a pinch of Fermentation salt and some maple syrup. This provides nutrients and conditions to select for more beneficial bacteria to thrive within the water kefir grain communities. It's better to have more beneficial bacteria than yeasts. Most of the microbial species living in these little water kefir grain communities are probiotic. Lactobacillus brevis, Lactobacillus casei, Lactobacillus hordei, Streptococcus lactis, leuconostoc mesenteroides, and Saccharomyces cerevisiae are just a few of the great microbes that live within water kefir grain communities. The awesome thing about water kefir grains is that they are reusable forever, as long as you take care of them! They even multiply, so you can share some with friends, and eventually brew gallons of water kefir at a time. Water kefir should be consumed in moderation. It still contains sugars, and too much sugar can disrupt a balanced gut microbiome. We drink a little bit of water kefir maybe once or twice a week. You should still drink regular purified water as your main source of hydration and consume water kefir moderately… in the same way you should consume wine responsibly, maybe one small glass a day. Fermented beverages are fun to make, and especially refreshing for summer. However, the probiotic power food champion remains to be fermented vegetables, consumed with ample fiber rich foods and plenty of good ole’ water. We decided on two fun summer flavors for this blog: Pineapple Mojito and Grapefruit Rosemary. Stay tuned for more flavoring recipes throughout the year, and a really fun recipe this fall incorporating our favorite local elderberry syrup to boost immunity during cold & flu season! Prepare sugar water mixture in a quart sized mason jar by adding 1/2 a cup of hot purified water to 3 tablespoons of organic unrefined cane sugar, maple syrup and the 1/4 teaspoon of Cultured Guru Fermentation Salt. Place a lid on the mason jar and shake until the salt and sugar are completely dissolved. Add 3 cups of cold or room temperature purified water. The total volume should be about 4 cups of water. Add the sugar water mixture to the activated water kefir grains. Most Water kefir grains come with instructions on how to activate them. Our water kefir grains came from Cultures for Health and included great instructions on activation. Cover jar with a cheesecloth, and secure with twine or cover with a seed sprouting lid. Allow kefir grains to ferment the sugar water mixture for 24-48 hours. 48 hours will be a more tart kefir. Strain the grains from the now cultured water mixture, and pour liquid water mixture into a bale top bottle or another quart sized mason jar. At this point you can chill and drink the cultured water mixture or put it aside for second fermentation flavoring! If you choose to second ferment, be sure the jar you are using is free of cracks. Second fermentations work best in bale-top bottles. Make a new batch of the sugar water mixture, as in step 1 and add it to the water kefir grains to start fermenting your next batch! For the Pineapple Mojito flavor: Purée the pineapple with a bit of filtered water. 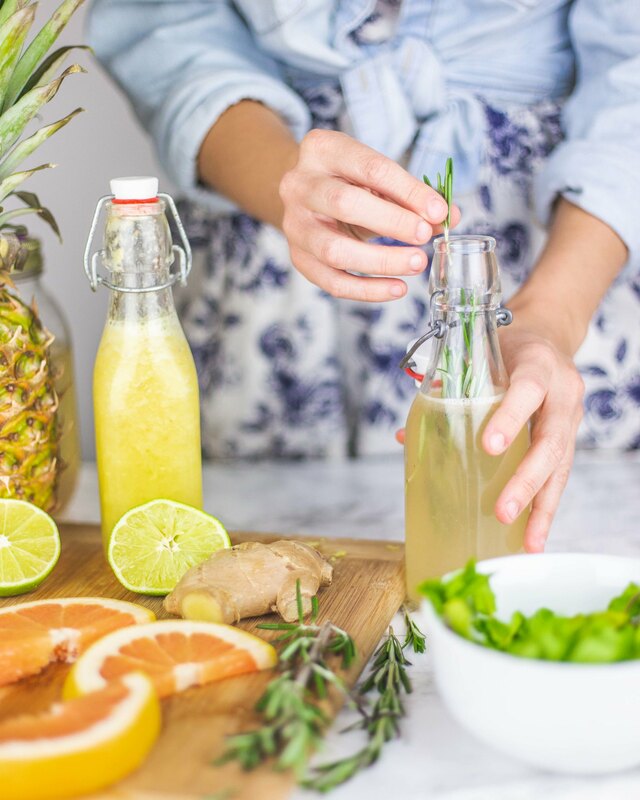 Add the pineapple purée, ginger, lime juice and mint to your bale top bottle and fill with water kefir liquid from the first fermentation. Secure the bottle lid and allow to ferment for 24 hours. After 24-48 hours, refrigerate immediately. 48 hours will be more bubbly. Enjoy over ice. For the Grapefruit and Rosemary flavor: Squeeze the juice from half a grapefruit into the bottle and fill with water kefir liquid from the first fermentation. Add 2-3 rosemary sprigs and secure the bottle lid. Allow to ferment for 24 hours. After 24-48 hours, refrigerate immediately. 48 hours will be more bubbly. Garnish with rosemary and enjoy over ice! To care for your kefir grains and continually make fresh water kefir, place them in a new batch of sugar water every 24-48 hours. To hibernate them, make a fresh batch of sugar water, add the kefir grains, and refrigerate immediately. When hibernating your grains in the refrigerator you will need to put them in a fresh batch of sugar water every two weeks.